The Nintendo Switch's Winter months may be dominated by the release of 'Lets Go Pikachu/Eevee' and 'Smash Bros: Ultimate' but the console is already looking ahead to 2019 with a slate of indy games set to be released. One of those such games is Square Enix's 'Octahedron: Transfixed Edition', a Platform game that looks incredibly vibrant and colorful. You can watch the trailer for it in the below Tweet. As you can see the game is set to hit the Nintendo Switch eShop next month, with a release on January 17th. There will be a pre-purchase discount of 25% and a demo is set to be released on December 28th. To me, this game looks like the platform version of 'Tetris Effect' with its neon palette of vibrant and psychedelic colours set to a driving soundtrack with heavy beats and synth elements. Octahedron is a psychedelic neon action platformer in which the player defies gravity by pulling platforms from thin air, while surfing through its levels to a driving beat. The game’s soundtrack, a vibrant array of uplifting and atmospheric tunes, from chiptune trance over synthwave to progressive house, has been turning heads since its original release! It features music by Chipzel, André Sobota, Monomirror, and others. With subtly evolving rhythm elements, Octahedron encourages players to get into the flow of its hypnotizing beats. The reviews they've used in the trailer praise the level design and describe it as the 'Dark Souls' of Platform games, which mean that players could be in store for a difficult and potentially frustrating time. Still, anyone who has a wide experience playing difficult platformers like 'Cuphead' could get a real kick out of this game, especially if they dig the overall colourful neon aesthetic and the soundtrack. 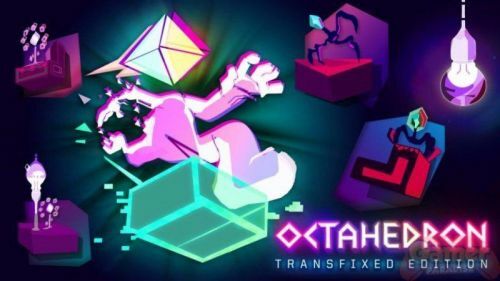 Just as a reminder, Octahedron: Transfixed Edition heads into the Switch eShop on January 17th, it's set to cost $12.99, £9.99 or €12.99.